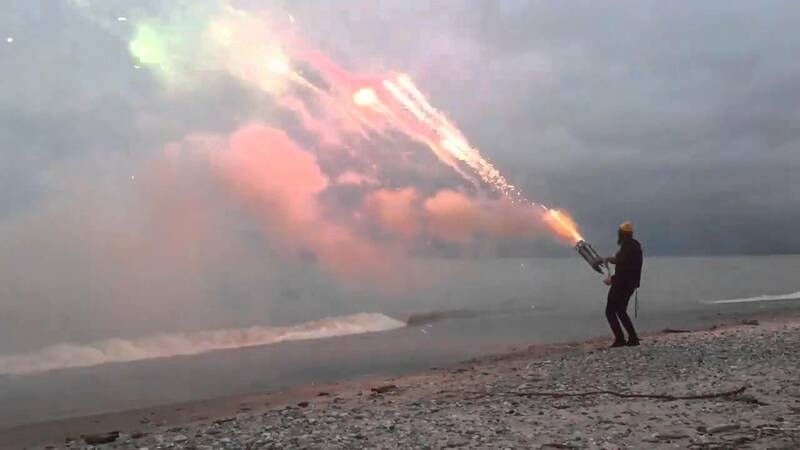 A couple of pyromaniacs recently decided it would be a good idea to make a roman candle minigun and then unleash its fiery fury into the sky while standing on a beach. The result is something that looks like a weapon taken directly out of Halo, a fiery turret of some kind. It was all fun and games until the creators of the video received a hefty citation from the local authorities, but for 1,001 shots in 45 seconds, it was probably worth it. They have a viral video to their names forever in the name of fireworks! Feel free to help the guys pay off their citation by visiting their newly established gofundme page. Seven “Cyber Cannon” fireworks strapped to a 3″ PVC tube with handles that fires 1001 shots in about 45 seconds. Filmed on 1/3/16. Do NOT in any way attempt to recreate something like this. It is not safe and just because it didn’t backfire on me doesn’t mean it won’t on you. Read the labels on your fireworks and follow their warnings!